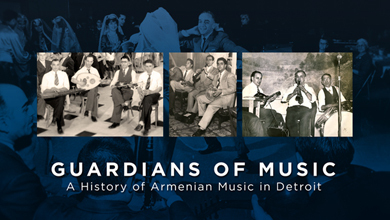 Guardians of Music, is a one-hour film documentary produced and narrated by 2012 Kresge Artist Fellow Ara Topouzian, a Detroit Armenian musician that benefited from the history of the Armenian music masters. The film will feature visits to local metro Detroit locations where Armenian music was once prominent, as well as rare interviews with some of the musicians and nightclub patrons of that era. Topouzian will share rare photographs, film archives and newspaper clippings that promoted music in the clubs and dance halls, showcasing the diversity and vibrancy of the Detroit multicultural music scene during that time period. Traditional Armenian folk music ranges from ballads that describe village life from past centuries to upbeat dance songs performed at weddings and community dances and picnics. These traditions have been handed down by generations of musicians, as well as survivors of the Armenian Genocide of 1915. These survivors emigrated all over the globe, many of them landing throughout the United States and specifically in Michigan. Total projected cost to produce the documentary was $24,000. In September, 2013, Topouzian was awarded a challenge grant from the Knight Foundation in the amount of $12,000. In order to receive this grant, an initial $12,000 must be raised by September 2014. This was accomplished. Contributions came from private and corporate donors as well as through online efforts via Kickstarter. The Kickstarter program raised over $8,000 in March, 2014. All disbursements for project expenditures were handled by the Miami Foundation. Major donors were acknowledged in the film credits. On March, 16, 2015, Guardians of Music made its premiere on Detroit Public Television (DPTV). As part of Armenian Heritage Night, the documentary helped raise over $70,000 for DPTV in one evening which was a resounding success. Detroit Armenian clergy were in attendance as well as members of the Armenian community working the phones in order to take pledges for the station. Its live! Guardians of Music airs! Couldn’t be a better choice. Thank you Ara for preserving our culture & traditions for generations to come. over abundance of the kanoon and not enough of the vibrant sounds of the classic oud and clarinet – familiar sounds that filled those halls and those dance floors! It isn’t just our “folk music” that represents the legacy for our people. We have been blessed with a wealth of music that enduringly represents who we are as a people, the suffering and the voices of the past that feeds our soul. Music divinely inspired, that transcends and fills our hearts and truly connects us to who we are. The haunting strains of our liturgical music and chants, the praising and worshipping that fills the pages of those exquisite hymns. we meet Him – in our worship and praise. Tell the story of our saints and the churches that were erected to glorify Him and the music that gives our faith the life and breath that sustained us a people. Beautiful! I especially enjoyed Holy Holy. Thank you for sharing!